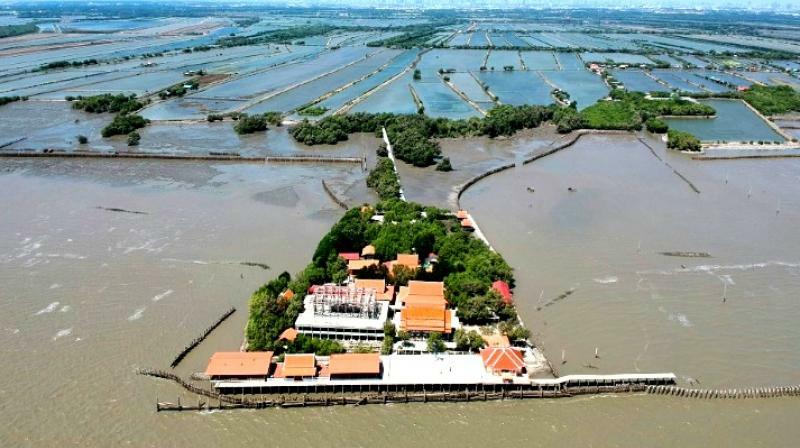 Against the tide: Thai 'floating temple' defies coastal erosion. Standing in his saffron robes near his monastery on stilts dubbed the "floating temple" the 51-year-old monk points out to sea at the spot where the local school once stood. "This temple used to be in the middle of the village," he tells AFP in Samut Chin, about an hour south of Bangkok. "If we moved it, people wouldn't even know there had ever been one here," he says of the temple, accessible only by a small footbridge today. These shores were once protected by extensive mangrove forests the Gulf of Thailand boasts some of the largest in the world, a natural defence against coastal erosion thanks to their extensive roots that stabilise the shoreline. But it's been a losing battle to preserve them. Thailand lost almost one-third of its vast coastal mangrove forests between 1961 and 2000, according to a report from the nation's Department of Marine and Coastal Resources and the UN Environment Programme. "The waves and tides are higher than before," said Thanawat Jarupongsakul, who advises Thailand's government on its policy to combat erosion.Asian and Caspian coastlines are the two areas in the world most affected by coastal erosion, according to a study published last year in the scientific journal Nature. It's a global problem: tens of thousands of square kilometres of land have been lost from coastal erosion around the world between 1984 and 2015 the equivalent of the surface area of Haiti was lost, the study said.